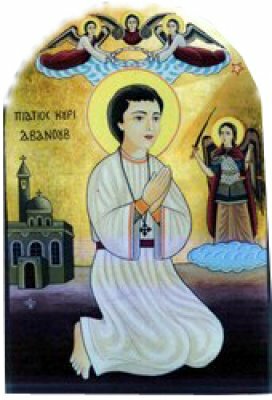 St. Abanoub was born in a village called Nehesa (near Talkha, Egypt) and was the only son of pious Christian parents who reposed in the Lord, when St. Abanoub was still a young child. At the age of twelve, Abanoub entered the church to hear the priest asking the congregation to remain steadfast in the faith in face of the fierce persecution of Christians instigated by Emperor Diocletian. On hearing this, St. Abanoub went out and gave out all what he possessed to the poor, and then set off to a city called Samannoud. While he was walking, he saw the Great Archangel Michael, who informed him that he would suffer for the sake of Christ in Samannoud and many other places. Upon arriving in Samannoud, St. Abanoub declared his faith openly in front of the Governor. The Governor ordered that Abanoub be tortured in many and diverse ways, but Archangel Michael would miraculously heal him after torture. The Governor then put him in jail with other Christians. In jail, St. Abanoub despite his young age, encouraged the other Christians to remain faithful to Christ (later on, those Christians were martyred for the name of Christ. The following day, the Governor took St. Abanoub on a boat to a city called Atrib. En-route, the Governor order that the young saint be hung upside down from the sail of the boat. The soldiers then began to drink and dance, while hitting St. Abanoub. Suddenly, the soldiers became blind and the Governor paralyzed. In their pain, they asked St. Abanoub to pray to His God to heal them. St. Abanoub replied saying, “This will only happen when we get to Atrib, so that everyone there should know that there is no other God but Christ.” When they did arrive in Atrib, St. Abanoub prayed for them and they were all healed. They then cried with joy and confessed their belief in the God of Abanoub. The soldiers took off their uniforms and threw them on the ground in front of the Governor of Atrib, who became infuriated and ordered that they all be killed. The Governor of Atrib continued to torture the saint severely, but God showed His power many times and stretched His Healing Hand to St. Abanoub. Many of those who witnessed the miraculous healing of St. Abanoub and his steadfast faith became Christians, and were martyred as a result. Finally, the Governor ordered the soldiers to kill St. Abanoub by the sword. Following his martyrdom, the Great St. Julius of Ekfahs, who recorded the biographies of many of the martyrs, wrapped the young martyr's body in fine linen and sent him to his hometown, Nehisa, where he was buried. In 960 A.D., his body was transferred to the church of Saint Mary in Samannoud, where it still lies until today. May the prayers and supplications of this great Martyr, the Child Saint Abanoub be with, us. Amen.